Heat waffle maker. If necessary, brush with vegetable oil before batter for each waffle is added (or spray with cooking spray before heating). In medium bowl, beat egg whites with egg beater until foamy. Beat in remaining waffle ingredients just until smooth. Pour about 3/4 cup batter from cup or pitcher onto center of hot waffle maker. (Check manufacturer's directions for recommended amount of batter.) Close lid of waffle maker. Bake about 5 minutes or until steaming stops. Carefully remove waffle. Repeat with remaining batter. Meanwhile, in small microwavable bowl, mix honey and peanut butter. Microwave uncovered on High 40 to 60 seconds or until warm; stir until smooth. Serve with waffles. 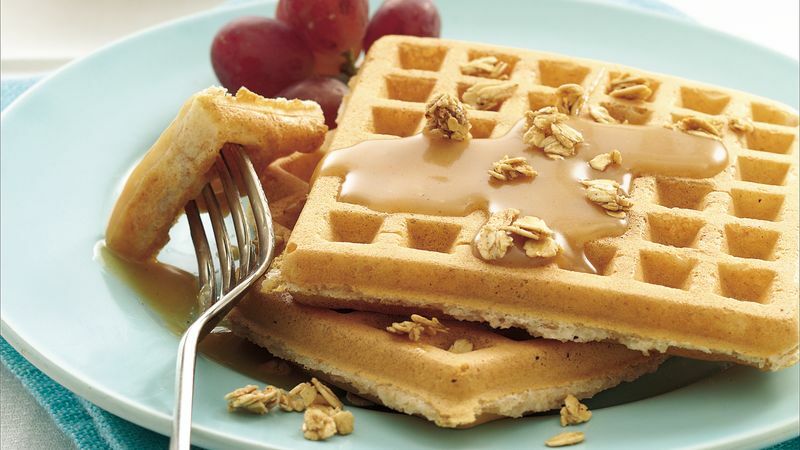 Top off these hearty, sweet waffles with a sprinkling of crunchy granola.